I love it when an artist really likes their finished creation, and Jody really loved this jar and thought I’d love it too. She was right!! 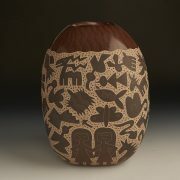 The tall and deep shape is terrific with a wide “canvas” area where the incising and story can be shown. 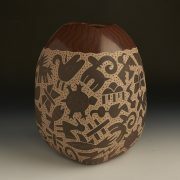 It is a hand coiled and incised jar, traditionally fired outside. She has entitled it “Shared Stories” It shows two girlfriends (herself and our friend, Glendora) as they meet for coffee to discuss their dreams and ideas. You can see fish, turtles, birds, butterflies, deer, horses, ram, dragonflies and more! It is both whimsical and sophisticated at the same time. The top area has curved and linear brown and tan polished lines leading up to a squared off opening. It is a stunning example of her work, when the designs simply flow. This is unmistakably a unique creation by JODY ! 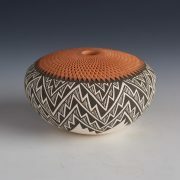 Jody Naranjo, has grown up in a family of celebrated potters. At age 19, she received a fellowship from the Southwestern Association of Indian Arts. 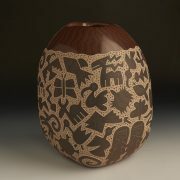 Then in 1992, she won first place in contemporary sgraffito at the Indian Market in Santa Fe. 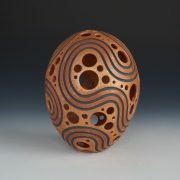 All her pots are sculpted from traditional clays. 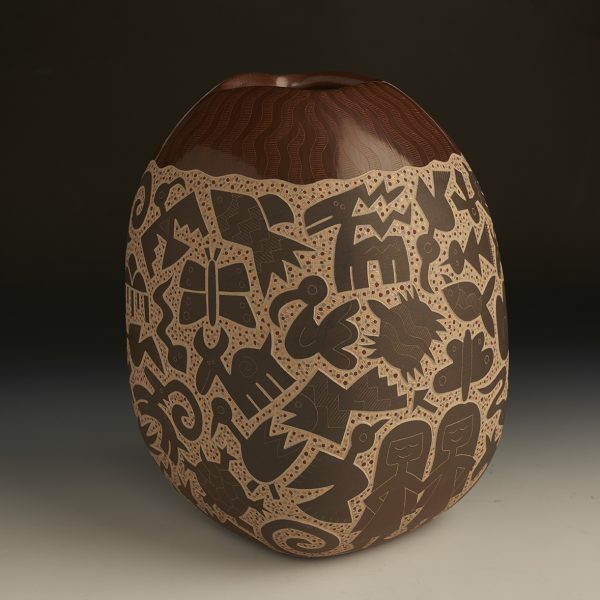 She is successful in blending traditional and contemporary art forms by carving contemporary images onto traditionally made pottery. 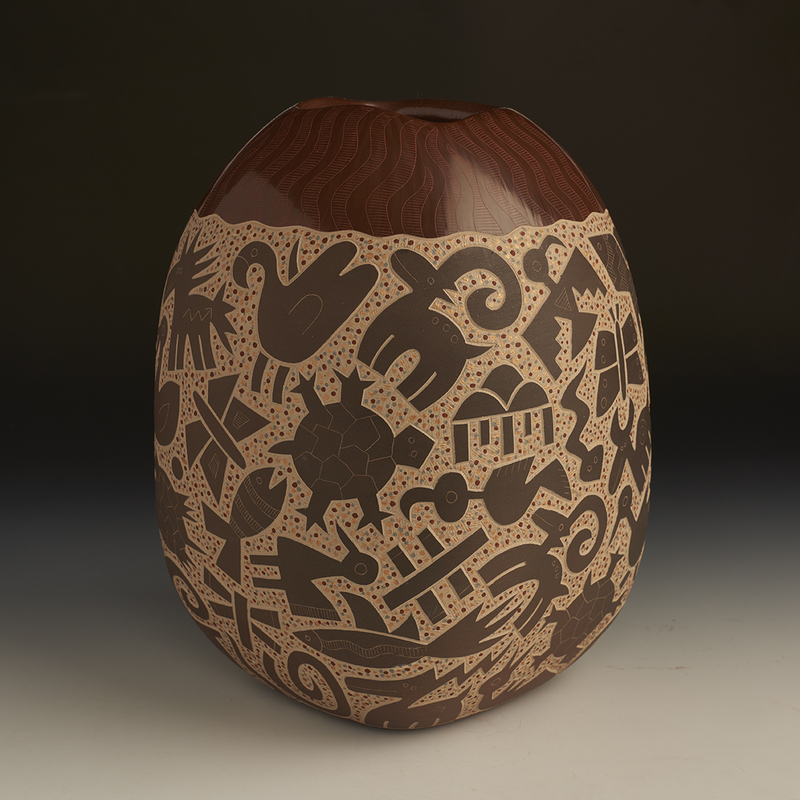 Her unique whimsical designs are etched into the clay with an exacto knife. Growing up with over 20 family members who made pottery, she knew the entire process by the time she was 6 years old. This early knowledge of the art form resulted in Jody pushing herself to be as good as she could be. 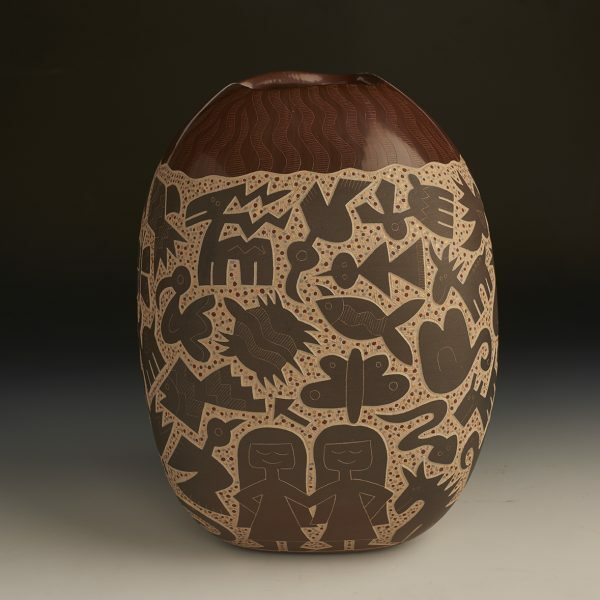 Her mom, Dolly, is a talented potter and teacher, and her aunt Jody Folwell, is one of the innovators in contemporary Pueblo pottery. What a great family of potters! Jody continues to produce new designs and shapes – constantly changing and evolving.